The meal kit industry is a rapidly growing industry with new companies emerging all the time. The companies that we are comparing today are two of the most established meal kit companies in the US, so this is a real battle of the giants! These two companies are Sun Basket and Blue Apron. Both companies offer a meal kits service, but there are some important differences between the two, and we are here to go over the plans in detail for you. Sun Basket offers two plan options, both include dishes suitable to many different diets. You can Mix and match across Lean & Clean, Paleo, Gluten-Free, mediterranean and more. When it comes to variety, Sun Basket has the upper hand – with an amazing amount of 18 dishes to select from each week. These dishes include option to satisfy people with special dietary requirements – like vegan, vegetarian, Mediterranean, pescatarian, paleo, gluten free, lean & clean and and a new innovative addition of diabetes friendly menu! On the other hand, Customers of Blue Apron can select from 8 dishes per week in the two-person plan of 4 dishes in the Family Plan. I am happy to say that most dish I tried from both Sun Basket and Plated tasted delicious! 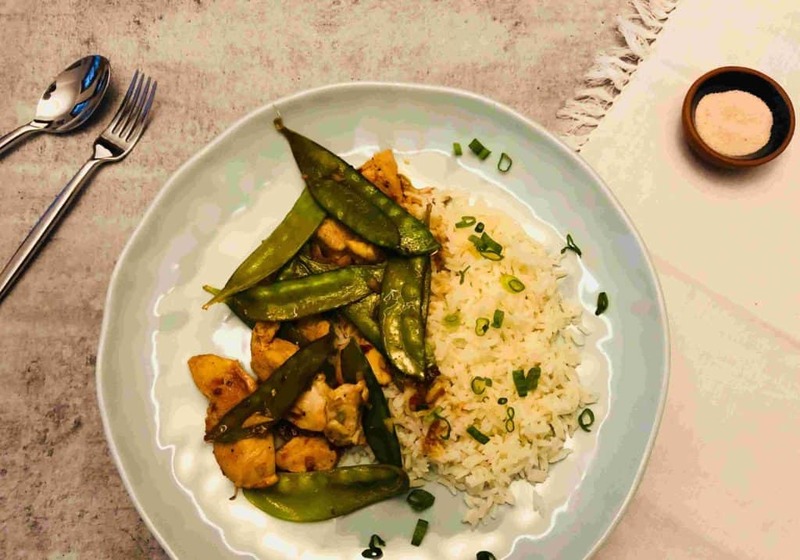 Our impression is that Sun Basket are more focused on creating recipes with a shorter cooking time, stating that most of their meals take only 30 minutes to prepare using easy-to-follow recipes. 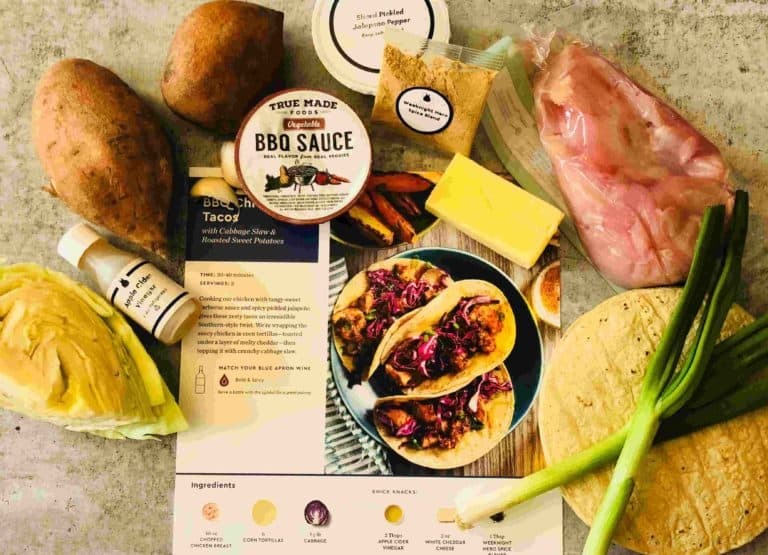 I would also say that Sun Basket is focused on bringing healthy dinner to the table, whereas Blue Apron offers a more classic with a twist dishes. See few examples of dishes we tried from Sun Basket and Blue Apron. 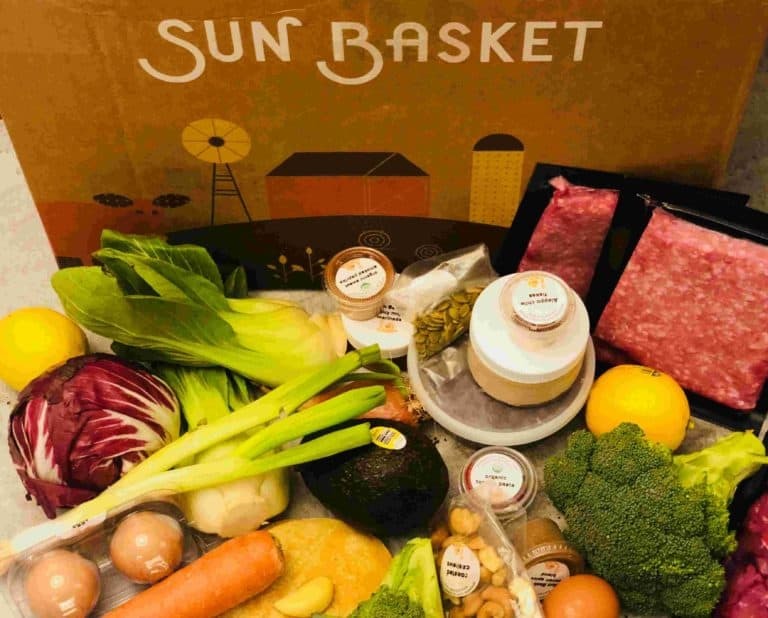 The products of both Sun Basket and Blue Apron are of exceedingly high quality. Sun Basket provide customers with the impressive promise that the ingredients of all meat kits are organic and sustainably sourced. This is a promise that we love! In comparison, Blue Apron, states that all meat products have no added hormones, all vegetables are farm fresh and where available organic and their seafood is sustainably sourced. The meal kit delivery from both companies arrives in a sturdy well-designed and labeled box. Inside the box, both companies ensure that the proteins are placed on the bottom of the box with sufficient ice so that box can be outside for hours without immediate refrigeration. There is a difference between the two companies when it comes to how the ingredients are arranged within the box. The ingredients of Blue Apron are all loose and unsorted within the box. There are few labels on ingredients and the ingredients of each specific meal kit have not been separated. 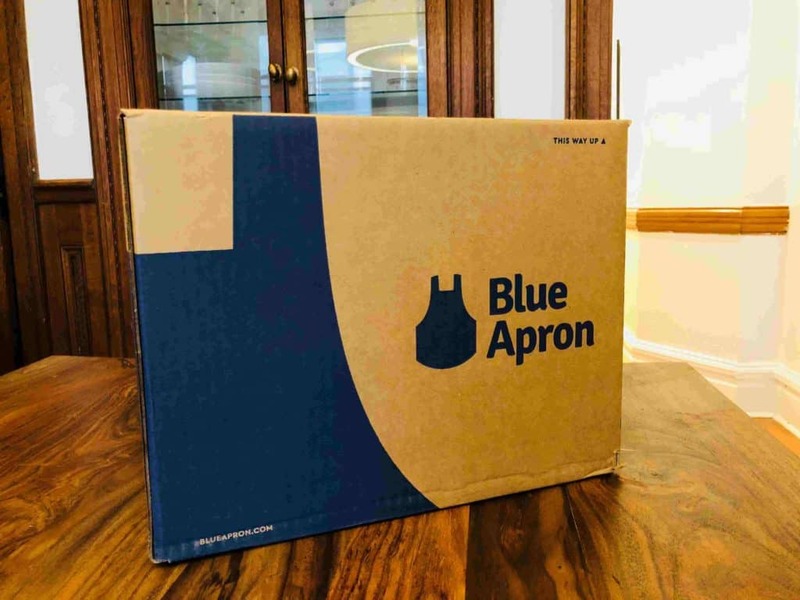 As the only item that is wrapped is a small bag of spices and seasoning, Blue Apron customers are required to sort the ingredients of each meal kit they have ordered. Sun Basket on the other hand, ensures that the ingredients of each dish are wrapped in a separated and labeled bag. both companies offer appealing, well organized and easy to use websites and apps. You can register, select your plan and desired dishes, define your eating preference, change your payment method etc – all online in a very easy and user-friendly way. The service for both companies is one of subscription, with both offering the option of putting your account on hold if you need to skip a week. They also both offer some flexibility in picking your delivery day. For account cancellation, for both, you need to contact customer support directly. Sun Basket offers one of their signature sauces every week for $4.99 . Blue Apron offers an impressive selection of wines, and they even recommend the right wine to accompany each dish, which is a lovely feature! They also have a retail service offering cookware and a range of kitchen supplies. 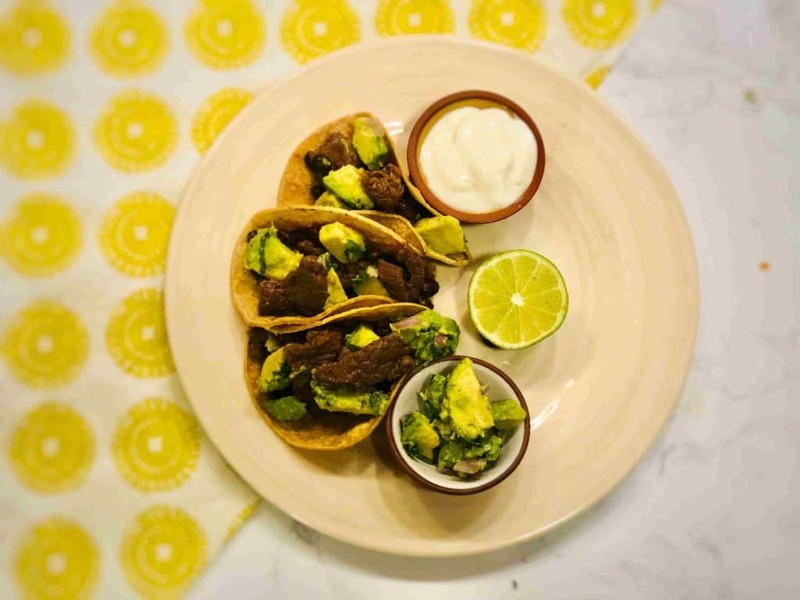 In general, we think that both are good and established meal kit services, but appealing to quite different audience – Blue apron offer a classic chef designed dishes with some twist and sun basket offer a much more healthy, organic and new aged foods, with great options to cater specific diet like paleo, vegan, gluten free, lean & clean and diabetes. 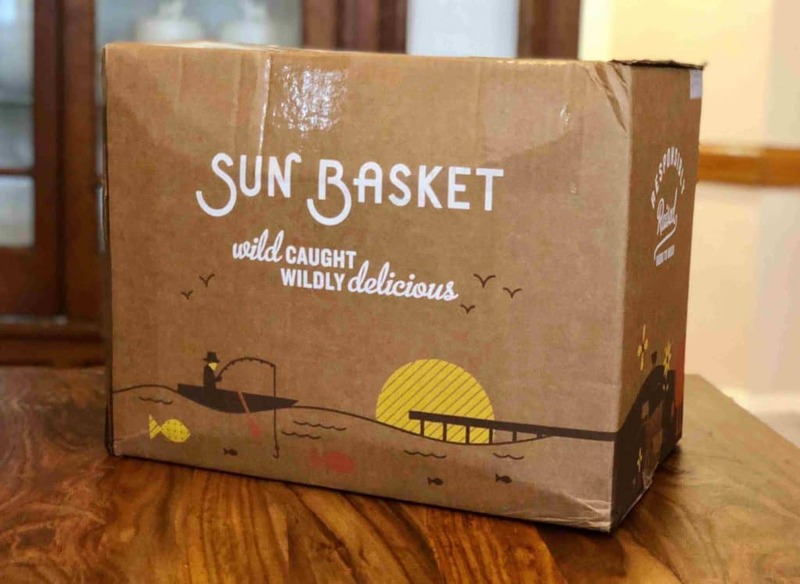 We found the offering of Sun Basket better – first of all, because they offer a much healthier yet delicious choice, with all organic and sustainably sourced ingredients. Second, because we feel their offering is better in terms of taste, variety and complexity of dishes per week, and the convenience of packaging!